Furbies were the first successful attempt to produce and sell domestically-aimed robots. They were launched in 1998. In April 2012, it was announced that Hasbro will be making a new line of Furbies, which was released in September 2012. 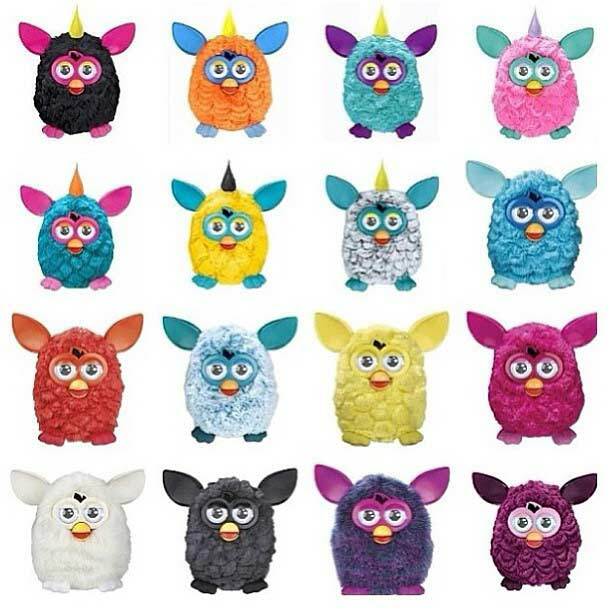 The Furby 2012 was first launched in six colors, one month later four other colors were added. A second generation of six Furbies, with styleable tufts of hair on their heads, was relased in December 2012. Compared to the original Furby, the Furby 2012 has more expressive LCD eyes, a wider range of motions, its own iOS and Android app (to feed, care and control the Furby), and the ability to adapt its personality in reaction to user behavior. Angry Personality : Furby will act grumpy and irritable. Get this by overfeeding. Diva Personality : Furby may turn into this personality if it listens to music for an extended period of time. Valley Girl Personality : Furby resembles a stereotypical teenage girl. Get this by talking for a long time. Cute Personality : Furby will act friendly and sing a lot. Get this by repeatedly petting it. Crazy Personality : Comedic and funny personality. Furby will often laugh like crazy over almost anything. Get by shaking and pulling tail. Default Personality : When you put the batteries in for the first time. To get it back, hold it upside down, hold the tongue, then hold the tail for a few seconds. Instead of flashing eyes, furby will reboot. In February 2013 the Furby Party Rockers were launched. They can sing and chat with Furby 2012 and with other Party Rockers, have a new voice and can be used with the app’s for IOS and Android. They only speak Furbish. There are 4 rockers in the 1st generation (Fussby, Loveby, Twittby, Scoffby) and 2 rockers in the 2nd generation (Wittby and Nerdby). In August 2013, the new Furby Boom was launched and became the No1 best seller this Christmas 2013. Furby Boom is packed with loads of new features and can be encouraged to lay eggs into your tablet, via the new iOS and Android app, which then grow to become a small virtual Furby (Furbling) that you can then feed, maintain and play games with, like the former Tamagotchis. By caring the Furbling you earn Furbucks to unlock other features and extras. Up to 50 eggs can be collected and will unlock a whole Furby Boom City. The first species of Furbies (1998 – 2005) communicate with infrared ports. The Furbies 2012 and later use an audio protocol to communicate with other nearby Furbies and with the apps. Igor Afanasyev (iafan) from Moscow, Russia, analyzed and recreated this audio protocol to communicate with Furbies using a computer. A Furby is an electronic toy made by Tiger Electronics (subsidiary of Hasbro Inc.) which was first shown at the International Toy Fair in 1998. Created by Dave Hampton and Caleb Chung, the classical furby, which is 15 cm tall, originally retailed for about 35 $US. They were hard to find at the beginning and the growing demand for these toys drove the resale price as high as several hundred dollars in newspapers and in auctions. Nicknames were given to them, and sellers assigned rarity values to them. Furbies 1998 mainly had only 1 personality which is a calm and friendly furby. 24 Special Editions were produced, which range from all different genres of events. Furbies 1998 can communicate with one another via a heart-shaped infrared port. Furbies start out speaking entirely Furbish, a language with short words, simple syllables, and various other sounds, but are programmed to speak less and less Furbish and more and more English as they “grow”. Simple electric motors and a system of gears close the Furby’s eyes and mouth, raise its ears, and lift it off the ground. The originals are still popular with many hackers as they can be dissected and made to do interesting things (see furby autopsy). In particular, their advanced audio capabilities and various sensory interfaces make them popular with the circuit bending community. In 1999, the Furby Babies were introduced, which are smaller than the original, have higher voices, and cannot dance. In the following years, novel furbys and furby friends were released, like Gizmo, Yoda, E.T. and Shelby. The third species of Furby, Emo-Tronic, was released in August 2005. Larger than the previous version, the new Furbies have been upgraded with a more emotional face and a voice recognition system, enabling them to communicate with humans. One year later, emo-tronic furby babies and funky furbies have been introduced. Furby 2012, also known as Furby 3.0, was the long awaited revival of the Furby series by Tiger. This serie was followed by Furby Party Rockers in February 2013 and by Furby BOOM in August 2013. In 1999, McDonalds teamed up with Tiger Electronics to create McFurbys, their latest Happy Meal toy. 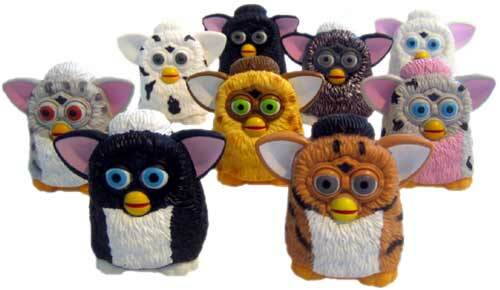 These were small plastic Furbies in a variety of colours. Some featured limited sound effects and/or movement capabilities. There were a total of 80 to collect. “Every furby deserves a home” is the motto of the Furby Adoption Center. Fun, chat, infos, artworks, photos, stories and overview of the furby generations are the content of this website.